Answer: Because, I was chasing it. I’m staring this story in the middle. Let’s rewind to last month. Apparently, every year the day after Mother’s Day my husband goes ‘chicken crazy’ and cannot rest until we have acquired MORE chickens. We have been hatching chicks from our flock for some of Ry’s friends. I think he had a harder time giving away our little ones then he thought he would. One of our hatchlings now a month old laying down in the sun on Pepper’s hand. Even Honey seems a little attached. You can tell she kind of wants to eat them but knows she will be in BIG trouble so she nudges them and sniffs their tails. A good compromise if you ask me. This brings us to the great chicken hunt of 2014. We went EVERYWHERE trying to find Americana/Aracana chicks. An hour into the trip I asked him why the heck we were doing this? We should be looking for Guinea fowl NOT more chickens! I thought we were not going to be getting any more chickens this year. He mumbled something about the need for “genetic diversity” and trailed off as we pulled into the third feed store of the day. Hours later we found an Agaway in the middle of nowhere that had some pretty good looking chicks. Many had patterns I hadn’t seen before in the Auracana chicks, this year or last. Since I was not going to turn down the offer of more chickens (no matter how unexpected) we got 10 more. Here are the little ladies almost a month later. The reason you should keep them refrigerated. Bringing our total up to 26 chickens in our flock. Why? Genetic diversity, I guess? Now the problem becomes integration. 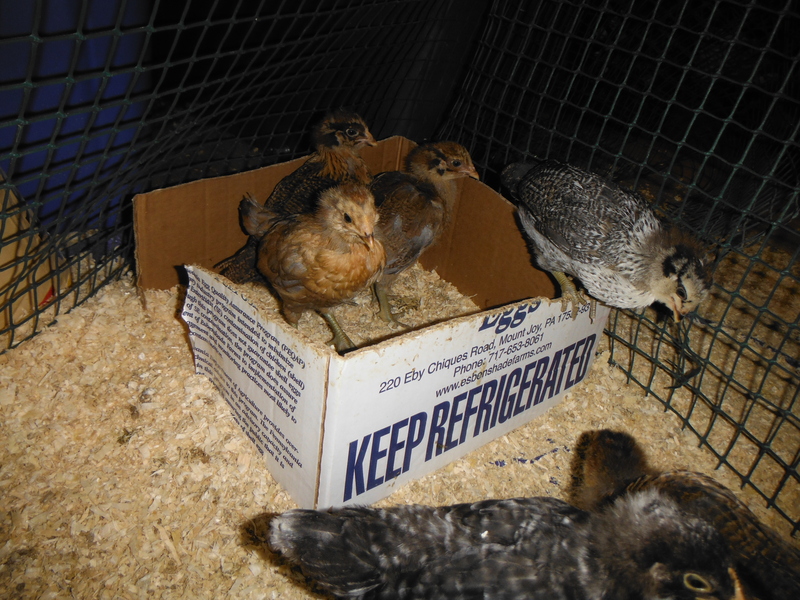 I liked having chicks around that I didn’t have to worry about mixing with our established flock. All the cute and fluffy- with none of the commitment. When you see the size of the adult chickens compared to the chicks it becomes immediately apparent that if they want to, the bigger hens can easily damage or kill the little ones. I have been taking some of the newbies on short field trips out to the coop to see how difficult a task this will be. Things started off pretty well, the chicks stayed close to each other and the hens came over to investigate. There was some pecking but when the little ones just peeped and stood their ground, I knew that these were not painful pecks. 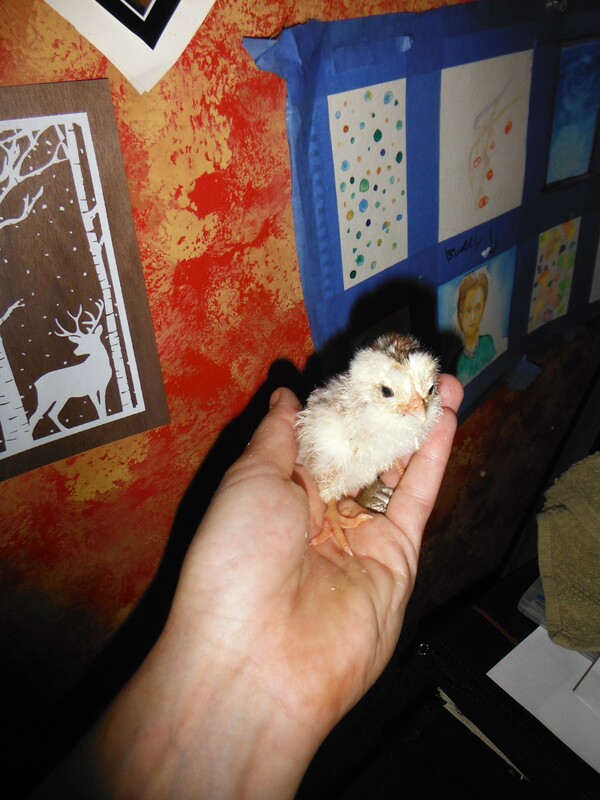 One of the Silver Lace Wyandotte (my most skittish hens and lowest in the pecking order) came over, puffed up as if to say: “I’m a big chicken what are you doing in MY coop” and preceded to peck/pick up one of the chicks. As you can imagine this did not go over well- with anyone. I immediately swated at the hen as the insulted chick ran screaming under the coop, her emergency squawks throwing the other chicks into “RUN!” mode. Chicks and chickens went everywhere. The problems was that the chicks can get through the fencing around the coop easily. The hens and I cannot so I found myself running in and out of the coop and through the woods on either side gathering the little ones together. Most came easily but there was one who just refused to be reasonable. 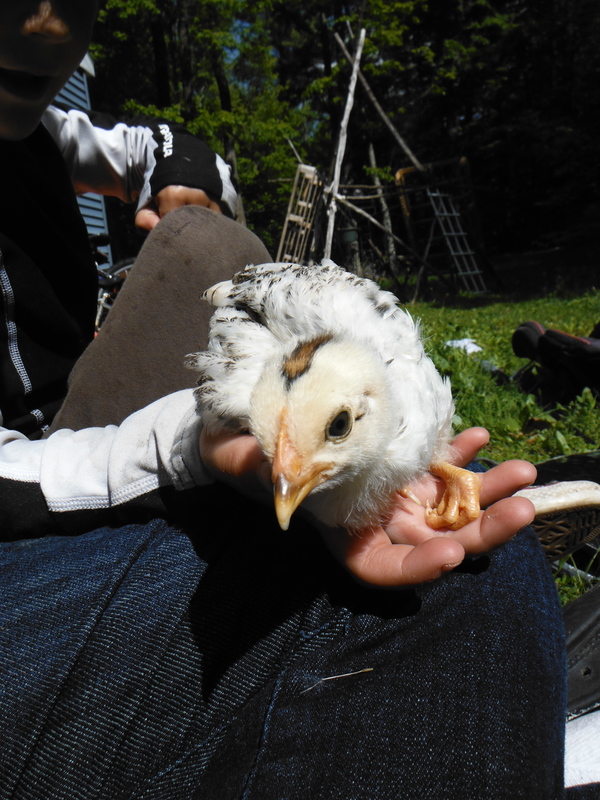 This was not the same chick that had been pecked (not hurt though, just scared.) It was one that decided it would be fun to have me running around through the brush and swampy area in-between the coop and the road. Screeching its little head off the whole time. After my forth time through the swamp she popped up on the side of the road and preceded to go across. Luckily our road is not very busy at all and I finally had a clear shot at the little peeper. I scooped her up and she quieted immediately and relaxed into my hand, panting. Ok, that was enough adventure for one day. Since the chicks are still inside I will have some time to come up with a plan to keep them safe while they all get used to one another. Just another homesteading puzzle to solve, wish me luck! It would appear we will need it. Poll If I Vacuum The Dog Will I Still Have To Vacuum the Floor?